All movement is good movement. At Armature we move people in lots of different ways, depending where they are at. ​We believe that strength training is the bomb. But so is Pilates. Anyone can do either, as everything is scalable. The huge variety of Armature classes, as well as a full time Clinical Pilates studio, means that our clients go up and down that scale, depending on what their bodies need at any particular time. Take the "mat to the rack". Or stay on the mat. Or mix the mat with Reformer. Or just hang from the rack. Or do everything. Armature has all options. We want to share the love of all things squatting, the versatile reformers, the brilliance of Joseph Pilate's classical work and the euphoria of lifting barbells. Armature has grown through its 12 years of establishment. But one thing that hasn't beefed out is the pricing. We're cheaper than generic, franchised fitness studios, yet provide quality, engaging classes in a boutique environment. Take advantage of our three custom-fitted and closely-situated venues, all for one admission. Come cross-train with us! With three unique and beautiful spaces, Armature's unique triple threat is consolidated around the Lygon Street/Victoria Street corner in bustling East Brunswick. Start with foundational bodyweight work and traditional Pilates at Armature Pilates. Layer Armature Reformer as a way to steadily progress to more loaded strength training. Try some scalable strength work and cardio cross training at Armature Strength. Or visit all three venues in tandem to co-train Pilates and Strength for the best of all worlds. Home to the clinical pilates studio and the custom-fitted mat room, Armature Pilates HQ is where it all began in 2006. Experience the big machines and gadgets of the Clinical Pilates studio in clinical Pilates and 1:1 sessions. Visit the timber-floored, steel-beamed oasis of the mat space with its unique wall springs and various small props. Strength training may sound scary, but there's nothing to fear in this beautiful, light-filled box. Being strong means being able to do everyday activities better and is proven to reduce pain and build confidence. Armature Strength caters for strength training at every level plus fun classes like Functional Fitness, Push Pull, Badass Box and Badass Barre. 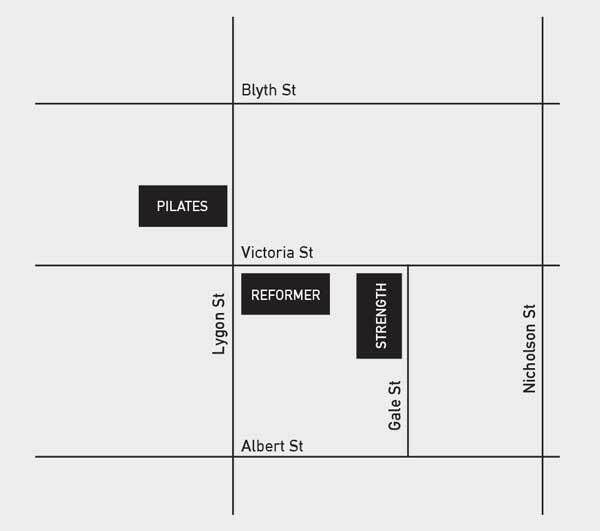 Open the beautiful blue door off Lygon Street and discover the magnificent reformers with their spring-loaded beds and never-ending exercise possibilities. Where else can you (sometimes) lie down and still work out hard? Armature Reformer's machines are top-of-the-line for full-bodied, flowing workouts with the smoothest rides possible. For anyone who wants to learn the basic ins and outs of Strength training. No experience required. Do Clinical Pilates if you need individual attention for a special condition or just want to work more slowly and detailed in your body. It's also an entry for clients looking for extra technique before jumping into group classes. A 1:1 Assessment is a pre-requisite for Clinical Pilates sessions. Park on Lygon Street and all surrounding streets including Victoria, Gale and Blyth Streets. Bike racks are aplenty and Trams 1 and 6 stop directly in front of Armature Pilates (our headquarters) and Armature Reformer. Have a question ? get in touch!